Susan Stuart was born in Worcester, MA, but lives and works in Albany. She received a BA from the University of Albany in 1976 and a BFA in 1969 from Syracuse University, Syracuse, NY. She studied with Rudolph Baranik at the Art Students League from 1991-1996. 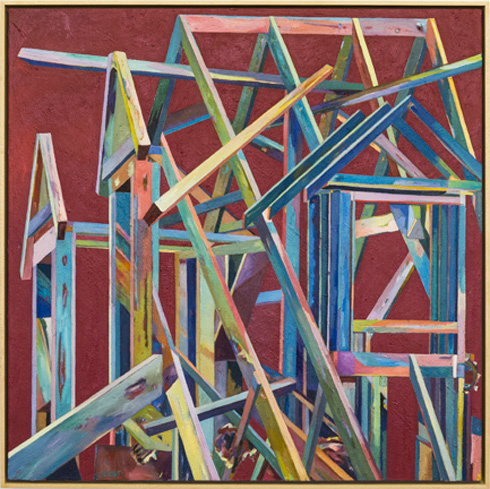 Stuart has won numerous awards for her work including a special merit at the American Drawing Biennial, Williamsburg, VA and in 1995 received national recognition from the Marie Walsh Sharpe Art Foundations’ Teacher Artist Program, Colorado Springs, CO.
Stuart taught high school art for 33 years and now continues her painting full time. Her work is based on the theme of architectural imagery, as well as a separate series based on the emotion and spirit of dogs.